Ashtavarga stands for groups of letters starting from a and ending with S.
The third letter in the group of S is s. Combined with akaara which is the biijaakshara of Hari it gives sa. The second letter in the group of letters starting with y is r. Combined with ikaara which is the biijaakshara of Kaama it gives ri. And so he goes on to explain how the seven svaras have yogic and spiritual import. Can u explain this to me when u have the time? (movie songs). I do like the focus you give to the ragaas chosen etc. Enjoyed reading some of your items in The Hindu and your blog as well. We love light music as well. If you let us know where you will be giving light music concert, we can try to make it and pass on the info to our Tamil friends here. In Zurich and Geneva they have fairly big Indian Associations, currently managed by Tamils of South Indian origin. In Lausanne we do have a smaller Indian Association which I was involved in launch a decade ago. Do let us know your itinerary here and possible visits in the near future. My name is sreevidhya ramanujam. i am 22 years old and i have just appeared for ca final exams. I have been learning carnatic music for the past 12 years from various gurus but i never understood its worth at young age n thus failed to practice the same. At my mother's insistence i would attend the classes n sing them again only during navarathris. i attended many concerts in last two years in chennai n started viewing telecasts in tv n have developed keen interest in music. i have become part of a bhajan team recently and am one of the lead singers in the group. i have also been reading ur columns in 'the hindu' regularly and that has made me realise the drawbacks in my knowledge. 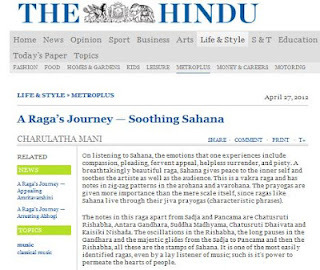 i do not intend to improve myself upto kutcheri level as am aware that it is too late to improvise my singing..
My problem is that i am unable to identify the ragas i hear, also i wish to enrich my knowledge on thalams..
i sought few teachers if they would be able to teach me alankarams in various ragas so that i can practice the same n be clear of the raga bedham but i could not find such a teacher. currently i am learning small devotional songs, keerthanams and re-practising the 15 varnams i already know, from a guru at nanganallur. i solicit your advice to enable me to really enjoy the neravals and alapanai with sound knowledge. Introductory speech said it all, but would like to add "Thenai Innamuthamumai Thithikindrathae" your Sahana Vocal. "Parthaen Srithaen" ....composed of words full of honey, and could hear it dripping in your voice too. You explained it and sung it well, so that people like me can get, not just the Raga but its Bavam correct too and it is your teaching that trapped me in carnatic music year’s back. I do sing "Iravamal Pirvamal" Thirupugaz, in Sahana, but would be great if I could hear it in your vocal with correct sangathis.